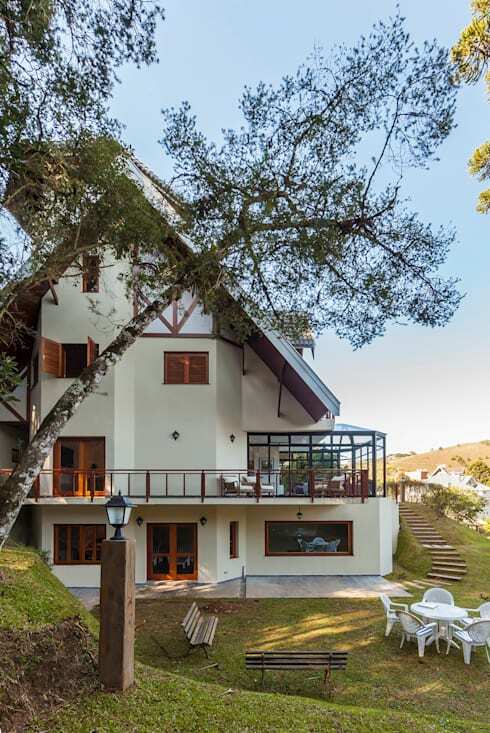 Today we’ll tour an adorable chalet tucked into the tropical hills of Brazil. This house will make you do a double-take! 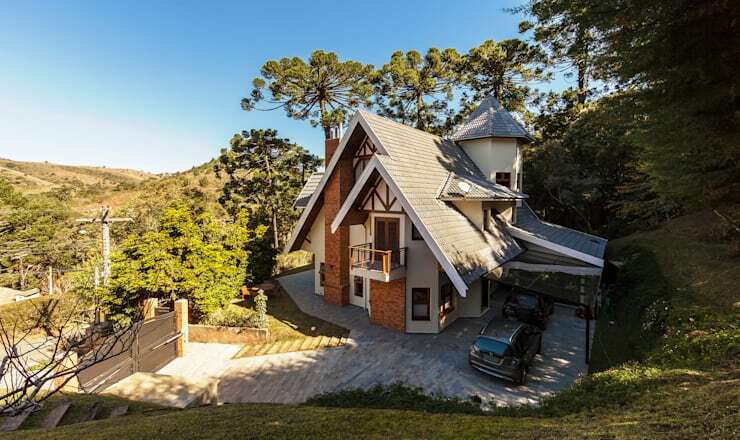 With a steeply sloped roof and German style woodwork, you would expect to see snowy hills instead of a tropical jungle. Inside we’ll find traditional and rustic elements mixed up with cool modern touches to create a perfect home. Ready to be inspired? The home we’re looking at today looks like an adorable gingerbread house. This home looks like it ought to be dusted with snow. Instead, it’s surrounded by tall jungle trees and lush green hills. There are plenty of opportunities to enjoy the outdoors around the home. A terrace wraps around the back of the house. There’s an exciting modern conservatory addition to the home that we’ll take a closer look at later. Now we can get a closer look at the home and its rich use of wood. Shingles on the roof give the home texture and character. The glass extension acts as a covered patio space. The wood furniture on the deck hints at some of the detailed furnishings we’ll see inside. Looking up at the chalet you can see how it emulates those European style homes in the Alps. The angles and pitch of the roof are inspiring. The cupula structure on the top of the house makes it look almost like a castle. This is truly a luxurious home! 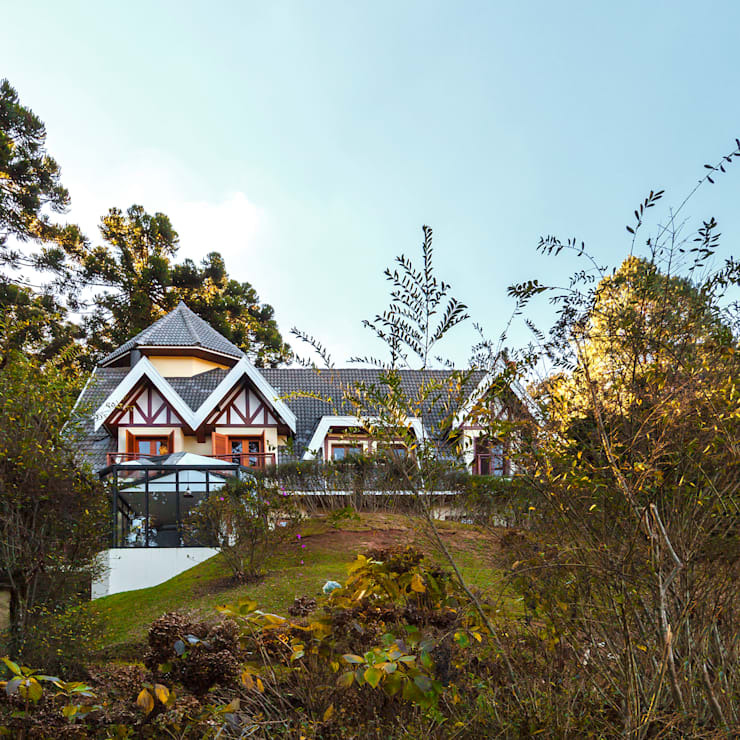 If you want to get a chalet look like this for your home, connect with professionals on homify today. 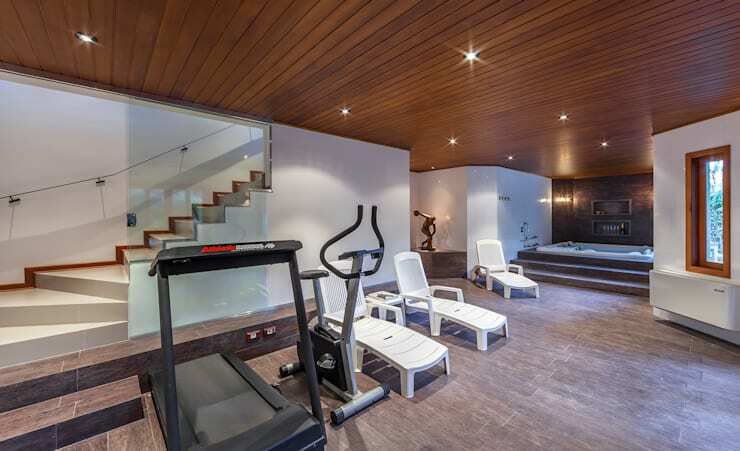 Lacking a basement, the bottom floor of the house has been converted into a health spa! Glamourous white stairs lead up to the main floor. Stone tiles on the floor and rich wood planks on the ceiling bring earthy elements inside. It's a healthy retreat inspired by nature. Certain corners of the home give off an antique rustic vibe like this office space. The interiors are wrapped with wood. 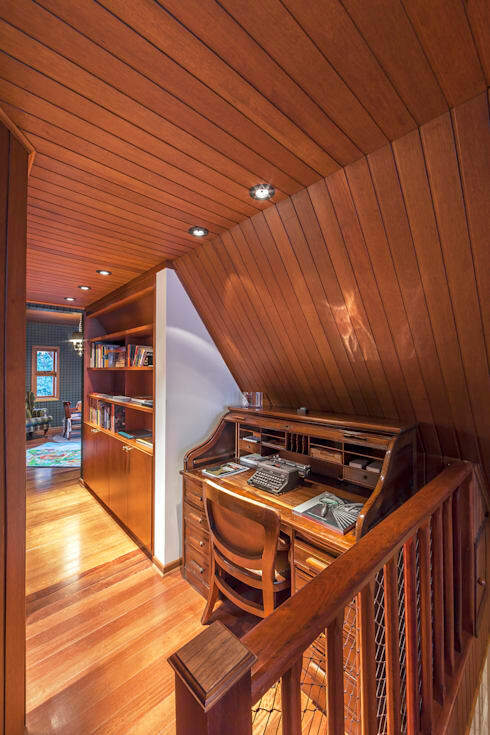 From the ceiling to the furniture, the warm shades of cherry wood are comforting. Walking down this hall, you might forget that you’re in Brazil and instead think you’re about to hit the slopes. The resemblance to a chalet is uncanny! In the kitchen, tiles on the wall give the space a folksy vibe. Pale brick beneath the counters and on the far wall brighten up the dark kitchen. 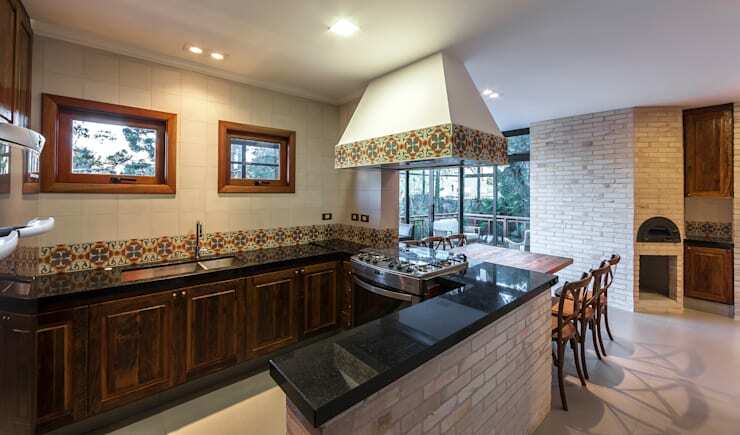 The oven hood looks charming with its ring of traditional tiles. 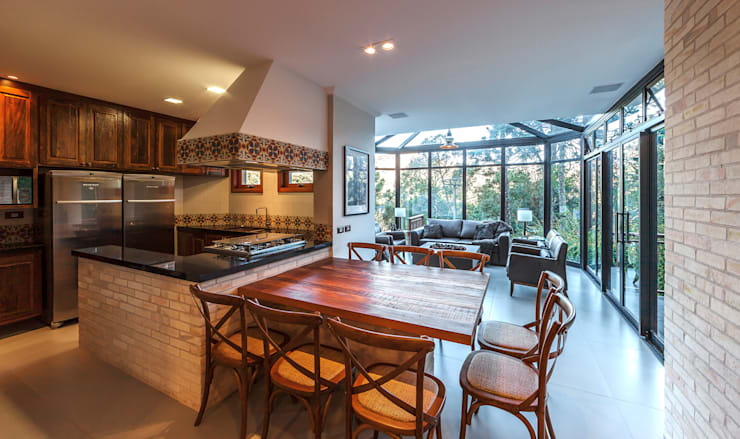 The dining table is adjacent to the kitchen, making it a convenient spot for sharing a meal with friends. The space is incredibly bright thanks to the surrounding glass walls. The wood dining table looks like a great spot to linger over a long meal. 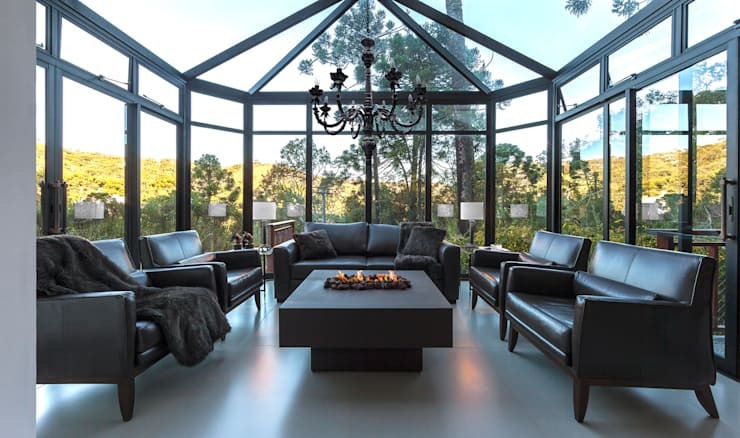 Decked out with black leather seats, the conservatory is a an inspiring modern space. Black framed steel and glass creates an elegant look. Bright white tiles on the ground make the space more bright and sophisticated. 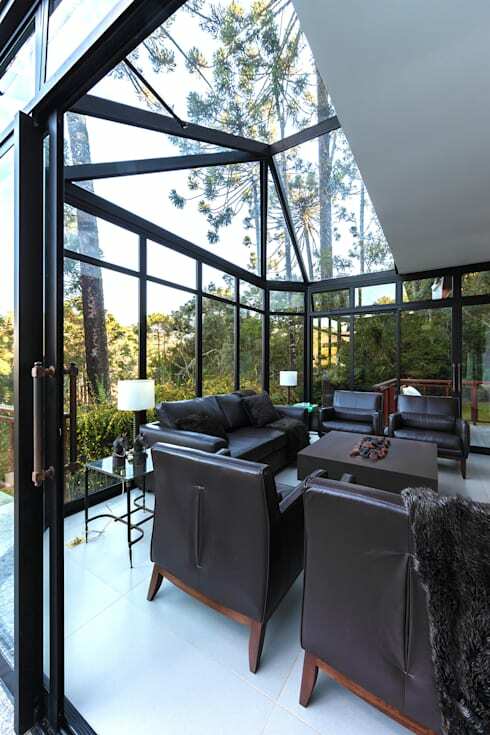 We’ll end our tour with this dramatic look at the conservatory, the most stand-out feature of this incredible chalet. Who wouldn't love to live in this home? A fire pit in the centre is perfect for entertaining. It creates a homey atmosphere in the glass room. A chandelier brings vintage character. This is the perfect spot to hang out and watch the sun setting on the green trees outside. If we had a conservatory like this, we’d never leave! For more tropical home inspiration, check out our feature on a home inspired by Bali. 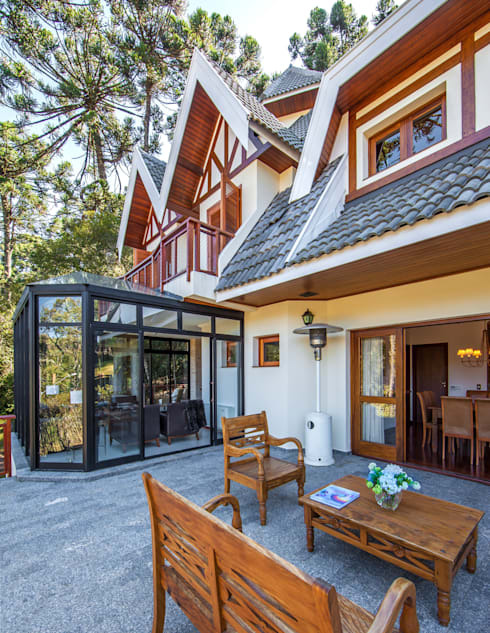 How do you want your chalet, in the tropical or alpine hills?